TUESDAY, APRIL 16, 2019 Connecting Your Community www.star.kiwi Shellfish gathering rules could change Memorial garden plants disappear EXHIBITORS INVITED NOW Lisa Lynch 021 800 809 Page 3 Page 4 Calling time after 45 years in the classroom • By Matt Slaughter MURRAY Wright (above) remembers walking into a staff room full of smoke and wearing shorts on his first day 45 years ago as a teacher at Shirley Boys’ High. The 68-year-old, who lives in Cashmere, said he had grown a beard to differentiate himself from his students. His attire and teaching style have changed a lot since then. “You only had three noncontact hours a week, I think my starting pay was $8000 a year.” “Teaching in the classroom was pretty basic with blackboard and chalk.” Mr Wright retired on Friday, and estimates he would have taught about 10,000 students geography, social studies and english over the course of his career. 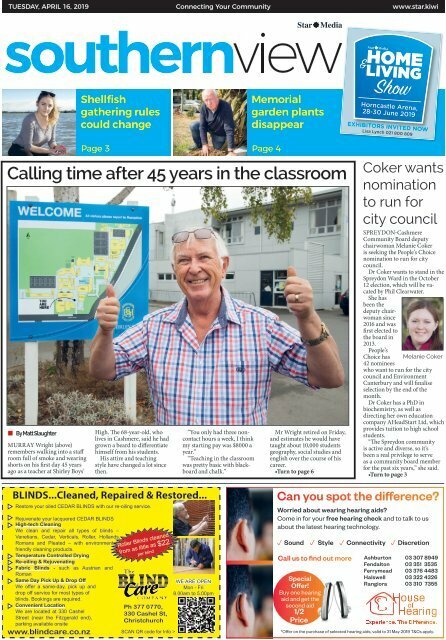 •Turn to page 6 Coker wants nomination to run for city council SPREYDON-Cashmere Community Board deputy chairwoman Melanie Coker is seeking the People’s Choice nomination to run for city council. Dr Coker wants to stand in the Spreydon Ward in the October 12 election, which will be vacated by Phil Clearwater. She has been the deputy chairwoman since 2016 and was first elected to the board in 2013. People’s Choice has 42 nominees who want to run for the city council and Environment Canterbury and will finalise selection by the end of the month. Dr Coker has a PhD in biochemistry, as well as directing her own education Melanie Coker company AHeadStart Ltd, which provides tuition to high school students. “The Spreydon community is active and diverse, so it’s been a real privilege to serve as a community board member for the past six years,” she said. •Turn to page 3 BLINDS...Cleaned, Repaired & Restored... Restore your oiled CEDAR BLINDS with our re-oiling service. Rejuvenate your lacquered CEDAR BLINDS High-tech Cleaning We clean and repair all types of blinds – Venetians, Cedar, Verticals, Roller, Hollands, Romans and Pleated – with environmentally friendly cleaning products. Temperature Controlled Drying Re-oiling & Rejuvenating Fabric Blinds - such as Austrian and Roman Same Day Pick Up & Drop Off We offer a same-day, pick up and drop off service for most types of blinds. Bookings are required. Convenient Location We are located at 330 Cashel Street (near the Fitzgerald end), parking available onsite Roller Blinds cleaned from as little as $22 per blind Ph 377 0770, 330 Cashel St, Christchurch www.blindcare.co.nz SCAN QR code for Info > WE ARE OPEN Mon - Fri 8.00am to 5.00pm Can you spot the difference? Worried about wearing hearing aids? Come in for your free hearing check and to talk to us about the latest hearing technology. p Sound p Style Offer! Buy one hearing aid and get the second aid p Connectivity p Discretion Call us to find out more Ashburton 03 307 8949 Fendalton 03 351 3535 Ferrymead 03 376 4483 Special 1/2 Price Halswell 03 322 4326 Rangiora 03 310 7355 *Offer on the purchase of selected hearing aids, valid to 31 May 2019 T&Cs apply.